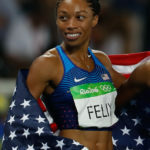 Allyson Felix is an American track and field sprinter who competes in the 100 meters, 200 meters, and 400 meters. At 200 meters, she is the 2012 Olympic champion, a 3-time World champion (2005–09), and 2-time Olympic silver medalist (2004–08). At 400 meters, she is the 2015 World champion, 2011 World silver medalist, 2016 Olympic silver medalist, and 2017 World bronze medalist.